This is the sort of discovery that I should save for the booklet I’m working on. It’s the kind of thing I should reserve to make money on via classes, books, etc. If I was a real cake decorating professional, that’s what I’d do. I TOTALLY JUST MADE EDIBLE FLESH-LIKE GUMMY. It was fairly inexpensive and easy, plus even tastes good. Finger-licking good. And we’re going to stick to fingers, aren’t we, because this is a family-friendly blog, right? Got it? Good. I previously discovered through experimentation that you can make a mold out of buttercream, freeze it, then put gummy in it. The cold buttercream pulls the heat out of the gummy so it sets up super-fast before the buttercream melts. I do actually cover this in the proto-version of the booklet I gave out at the class I did on advanced gummy techniques, but it says in there more experimentation is required. That’s what I did today. Make this as big as your hand. 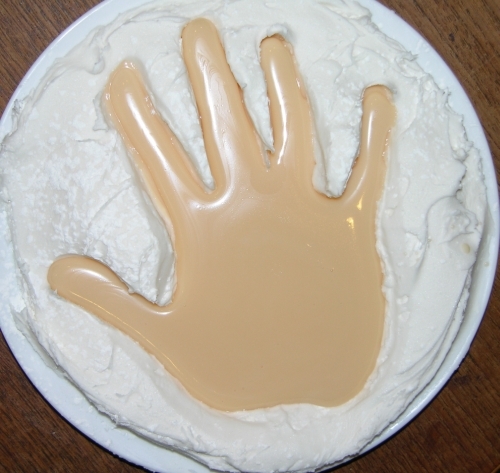 If you have a bear paw hand, use a bigger plate and more buttercream. 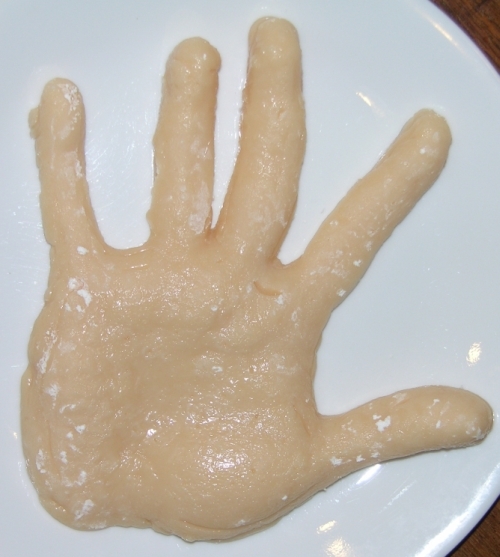 My daughter wants her hand molded next so I'll use less on a smaller plate. Math is fun. Then I sprinkled cornstarch all over the surface and on my hand. 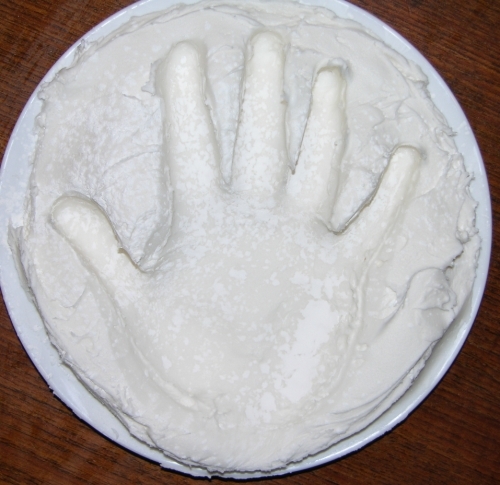 I pushed my hand straight down into the buttercream, then lifted it out as carefully as I could. Some stuck, which means I probably should have used more corn starch, but I patted the big lumps back down well enough. The flash kind of makes this look like the hand is popping out. Now that I said that, it's hard to see it the proper way, isn't it? We are so totally ruled by our perceptions. I popped that whole plate into the freezer for a couple of hours while I went to pick my daughter up from school. Mom stuff always comes first! Then I bloomed a single packet of Knox gelatin in about 1/8 cup of water and added it to the re-melted leftovers from yesterday’s white-ish opaque gummy experiments, plus the tiniest bit of Wilton Creamy Peach colour (and I really mean tiny, as in a toothpick end mixed with a bit of the gummy in a separate bowl and then about a quarter of that mix put back into the pot) to give the ivory-toned gummy a pinkish hue. That resulted in a colour somewhat close to band-aids, which are Caucasian flesh-ish, in that if a regular band-aid ever matches your flesh you should probably see a doctor for more than the cut under the band-aid. 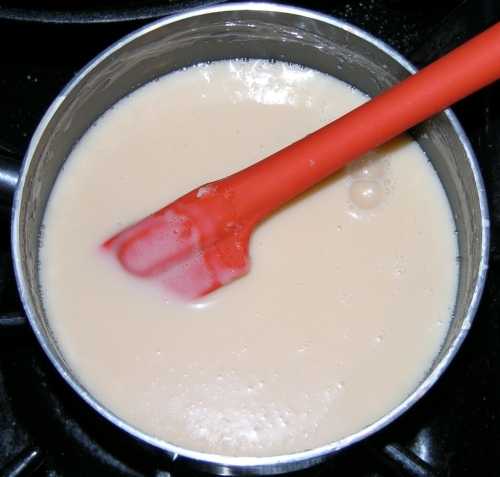 Look, an actual flesh-pot. Family friendly, family friendly! I cooled the gummy as much as possible without letting it get too close to being solid. Then I brought the plate out of the freezer and swiftly used the baster to give a thorough first coat to the mold. See, if I did it in pieces, there might be seam-lines. But by coating the whole mold and then going back for more and piling it up slowly, not only did I avoid having the heat overwhelm the frozen mold, but I also buried any seam lines inside. I’m a tricksy mama. Layers built up until the mold is full. Then I put the whole thing back in the fridge for awhile until I was sure it was completely firm. However, I’ve learned from experience that the gummy is going to make a water layer between itself and the buttercream that will start to dissolve both. Therefore, I knew I couldn’t leave it in there for too long; just long enough to be solid, no longer. I pulled the hand out and flopped it onto another plate. Voila! Floppy fleshy gummy hand! Insert obligatory applause joke here. My hands are really pink because they're almost always hot, especially when I've been working it in the kitchen and washing them in warm water constantly. There you have it: not only can you make your own molds for gummy without having to buy expensive silicone kits (which I covet but cannot cost-justify since nobody pays me for any of this, see opening paragraph), you can use sweetened-condensed-milk-based gummy to simulate flesh. 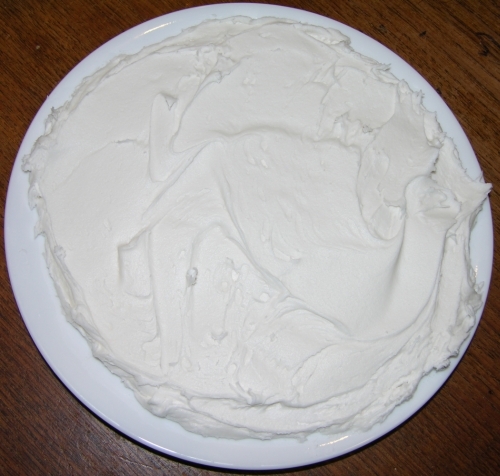 This bit of evidence is destined to be shown at my demo for the Houston Cake Club’s event on Sunday. I shall resist the urge to have it wave all the way on the drive down! But I do expect at least one squeal when I pull it out in the middle of the demo. I’ll be disappointed if nobody makes any strange noises! 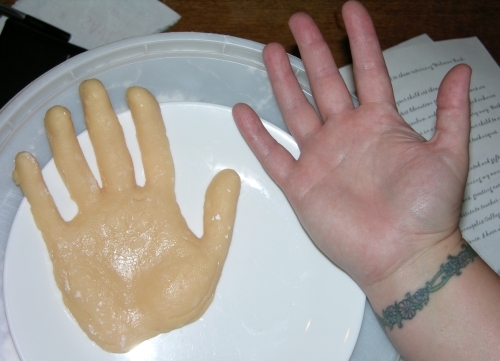 I’ve also popped it back in the freezer and might make a regular-translucent-gummy hand soon. If I do, I’ll post it later. This entry was posted in Experimental Techniques, Gummy, Sick and Twisted. Bookmark the permalink. That’s fantastic. Simple in principle, but with enough of those little details that show how much you actually know about this. And you should totally make a book about your discoveries and fun ideas.